Taking the Kotor Bay ferry can save you a lot of time when you're travelling between the Herceg Novi and Tivat parts of the Bay of Kotor. It can also become part of a great 'around the bay' day trip itinerary... scroll down to the bottom of this page for ideas. The ferry runs across the narrowest part of the Bay of Kotor, the Verige Straits. And it docks in Kamenari on the Herceg Novi side and Lepetane on the Tivat side. The name Lepetane is derived from the word 'lepote' meaning beauties. Swashbuckling Bay of Kotor sailors of day of yore would return home to the bay and their families, passing Lepetane on their way. They'd drop their 'beauties', their mistresses off here and carry on to their homes. Hence the name Lepetane. 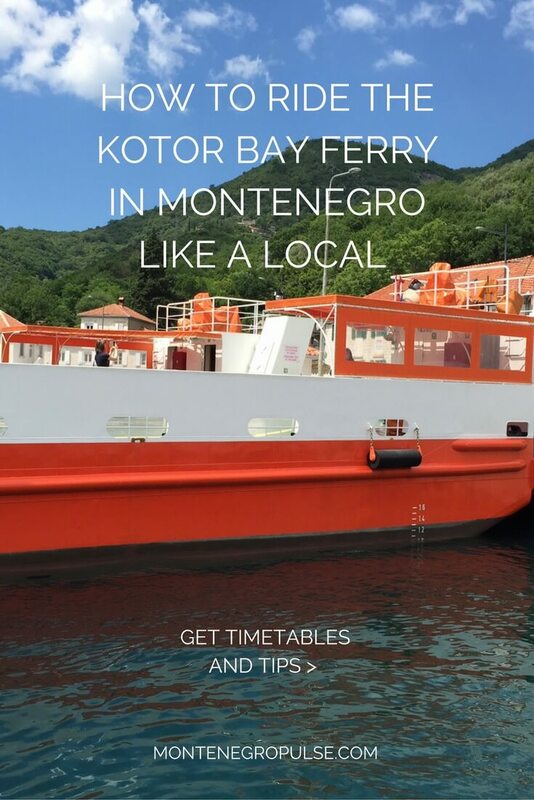 The Kotor Bay ferry only takes 5 minutes and it's a fun ride. You'll be treated to some lovely scenery and you'll be able to take lots of photos, especially on sunny days. Make sure you keep a look out for the two islands of Perast while you're crossing. You'll get a view of them in the distance when you're in the middle of the channel. If you're arriving into Montenegro via Dubrovnik airport and you're staying Tivat, Lustica Peninsula, Budva, Bar, Ulcinj or Skadar Lake, you'll probably want to take the Kotor Bay ferry. You can drive around the bay and in fact I highly recommend it, it's one of the most scenic drives in Montenegro, but you might not want to do it when you've just arrived. If you're staying in Kotor, or anywhere in between Herceg Novi and Kotor (like Perast), you should drive around the bay. It'll be faster. If you're staying in Muo, Prcanj or Stoliv, you can take the ferry across and then turn left and take the seaside road to your destination. Instead of turning left when you get off the ferry, turn right and drive through Tivat and past the airport. Turn left at the roundabout and head for Kotor. You'll go through a tunnel and at the bottom of the road you'll come to another small roundabout. Turn left here and follow the road along the seaside. This is the same seaside road that leads to the ferry dock in Lepetane. There are 6 ferries running 24 hours a day throughout the summer months. The ferries depart as soon as they're full around the clock. You don't have to wait more than 15 minutes for a ferry to fill up, even if you're the first one on it. 6am - midnight daily: The ferries depart when they're full or every 15 minutes. Departures from Kamenari: midnight, 1am, 2am, 3am, 4am, 4.50am, 5.20am, 6am. Departures from Lepetane: 12.30am, 1.30am, 2.30am, 3.30am, 4.30am, 5.05am, 5.40am. You can only buy tickets for the Kotor Bay ferry at the ticket kiosks where the ferries dock. Park your car in the queue and go to buy a ticket at the counter. They'll be appreciative if you have the exact change ready and especially if you don't hand over any large notes, like €50 or more. You can only pay in cash, in Euros. There are no card payments so if you don't have cash you'll have to go back to either Tivat or Bijela to find an ATM. There's a bus that goes from Igalo to Kamenari and back every half hour. Because of Herceg Novi's one way system, it goes along the lower road that passes the old town towards Kamenari and returns via the main road, which is the Adriatic Highway. There are two buses running through Herceg Novi, only one goes to Kamenari. Be sure to check the bus you get on has a sign in the front that says 'Iglao - Kamenari - Igalo'. The bus fare depends on how far you're travelling, but will be €1.50 at most. Departures from Igalo every 30 minutes on the hour and half past from 5.30am - 1am. Departures from Kamenari every 30 minutes at 20 past the hour and 10 to the hour from 5.20am - 1.50am. * On Sundays the buses go every hour instead of every 30 minutes. It departs from Igalo every hour on the hour. It departs from Kamenari every hour from 5.50am. 1st June - 31st August: Departures from Tivat centre by Magnolia Square (see map below) every hour, on the hour from 6am - 10pm daily. 1st September - 30th May: Same as above except no departures at 10am, 5pm, 7pm, 9pm or 10pm. Service stops at 8pm. The trip is 6km and takes approximately 15 minutes in both directions. The bus fare is €0.70. 1st June - 31st August: Departures from Tivat centre by Magnolia Square (see map below) every hour, at half past the hour from 6.30am - 10.30pm daily. 1st September - 30th May: Same as above except no departures at 10.30am, 5.30pm, 7.30pm, 9.30pm or 10.30pm. Service stops at 8.30pm. Always use your handbreak: I can't tell you the number of times we've seen a car roll back into another because the owner forgot to use the handbreak. The ferries are moving and your car will move too if the handbreak isn't on. If this happens to you and your car is damaged, you'll need to stay on the ferry until the police come to fill in an accident report. This is the only way you'll be able to claim insurance on any damage. Obviously it's a major inconvenience for the ferry operation and other travellers, so this is the most important tip I can can give you. Watch your doors: When you get of your car to make the most of the trip and enjoy the scenery, take care not to hit other cars with your doors. The cars are parked close together and it's easy to hit your neighbour if you're not careful. Don't buy two tickets: You might be tempted to buy two tickets, one for your return journey. This is against ferry policy and they might make you buy another ticket if they notice you've done this. You're better off taking an extra two minutes on your return trip to buy another ticket. 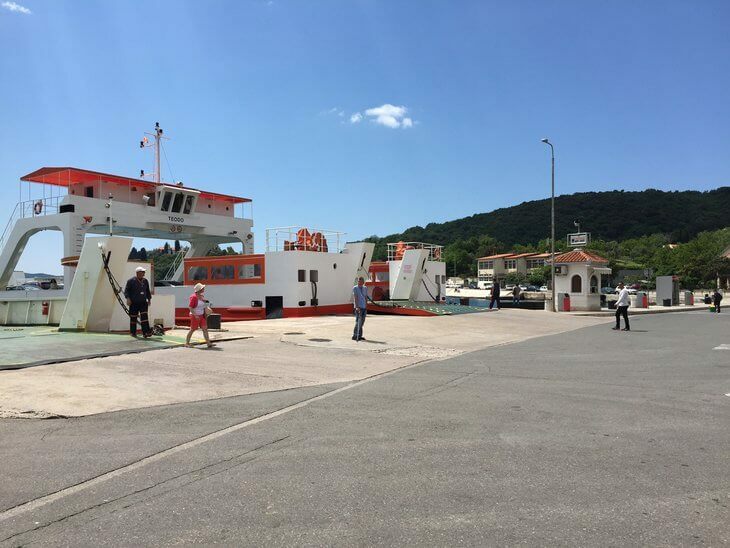 Be patient and follow the staff: In summer there can be queues for the ferry and it's relatively chaotic for most western tourists. People are pushing to get on and you might feel like you'll never make it. Just follow the staff's directions and go where they tell you to. 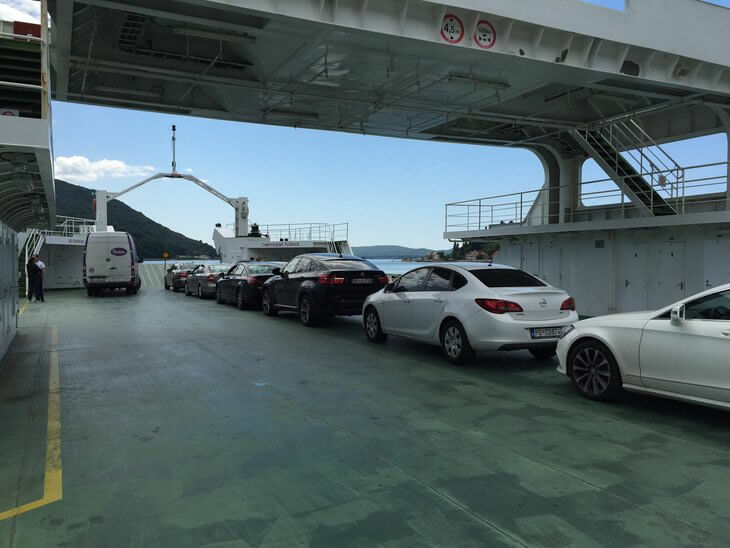 The ferries can fit a surprising number of cars and you'll cross without incident. Exit in order: When exiting the ferry, the centre row goes first, followed by the left and right rows, followed by the far left and right rows. People will push and try to skip ahead (I don't know why, they might get out 15 seconds faster at most. I think it's just a local habit). Just follow the order and go when the staff wave you to go. Cash only: Don't forget, you can only pay for ferry tickets with cash and only Euros are accepted. Taking a drive around the Bay of Kotor will show you some of the most beautiful scenery in Montenegro. You can incorporate both a drive around the bay and a trip on the Kotor Bay ferry in one day trip. Drive to Kamenari and continue past the ferry terminal. Continue to Morinj, stop at Catovica Mlini for coffee. Continue on and stop in Risan to see the Roman mosaics (€2 per person). Keep driving until you reach Perast, park in the carpark. Visit the Perast museum and take a boat to Our Lady of the Rocks. Have lunch in Perast. Drive to Kotor. Take a walk or tour through the town. Drive to Tivat and have dinner and cocktail in Porto Montenegro. Return to Herceg Novi via the Kotor Bay ferry. Drive or start in Kotor. Take a walk or tour through the town. Drive along the coast to Herceg Novi. Turn towards the sea at the traffic lights, follow the one way street and park in town. After visiting Herceg Novi old town, drive back to Tivat via the ferry. Have dinner and cocktail in Porto Montenegro.